Awesome Note for the iPad, why didn’t someone tell us?! How did we miss this? 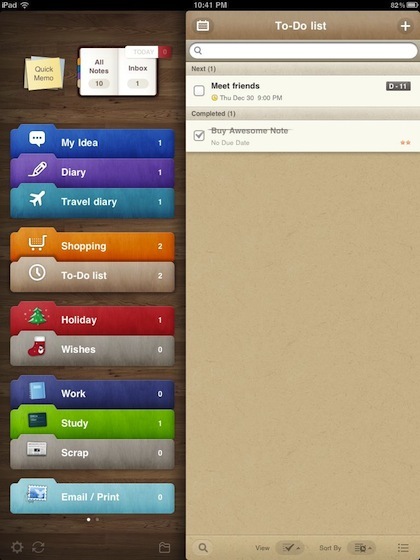 Version 1.2 of Awesome Note for iPad is already out, we are way behind! The app has a lot of us using it’s iPhone version, so a iPad (big screen) version is a very welcome site. 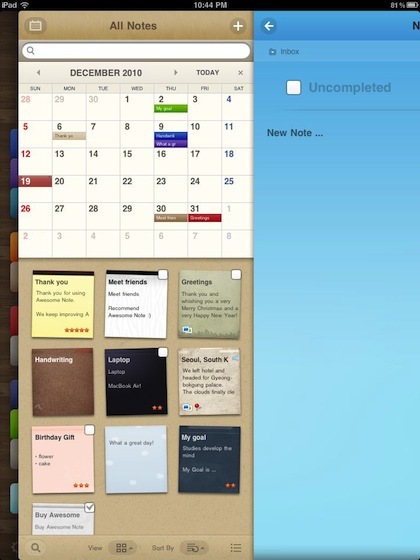 If your not familiar with the app, it is an option best suited for folks that keep a lot of short notes that they want to organize quickly, then to find and use later. The notes can have all sorts of extra items inside of them, they can have a large variety of look and feels… and they can tie out to a calendar. Whew, got that all out in two sentences. Oh, forgot the mention the long list of ways you can share your notes out as well manage through cloud services. 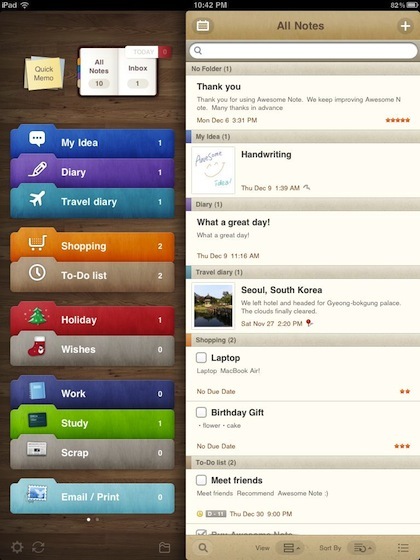 Your notes in Awesome Note are divided into folder tabs, which can be customized with colors and names. 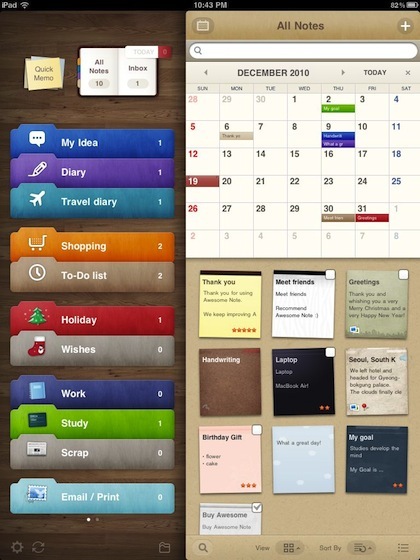 We like the ability to have layers of information so it is quick to have a note open and see a calendar or folder view without moving away from the note, just sweep the note to the side limited view and back out to full view. Handy when setting up ToDo lists that are date based so you don’t double up on projects at the same time. 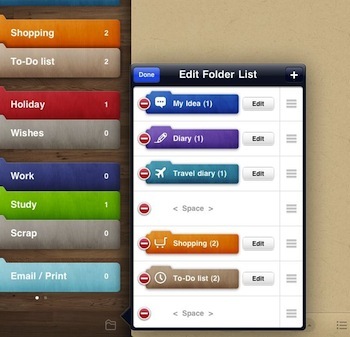 Folder, note items and the calendar can be shown on the screen at the same time when there is a need to see ‘the big picture’. Swiping windows in Awesome Note will move them over a lower layer allowing for quick views and edits without leaving and area and then multi clicks to get back to the previous view. 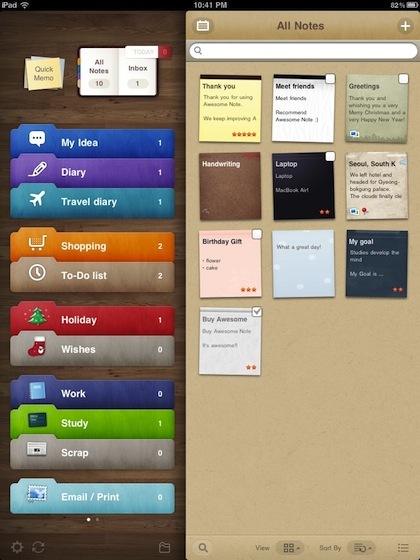 The list of notes on the right does not have to be the small ‘post it’ like note images. Those are nice when you have custom papers used on different notes. Choosing the ‘View’ button at the bottom of the page allows you to choose: Thumbnail, List, To Do, Diary, Detail and Photo. The multiple layers of sharing across systems is a win for us. Choosing the ‘settings’ option on the lower left window gives you access to set up transferring, backups and syncing. 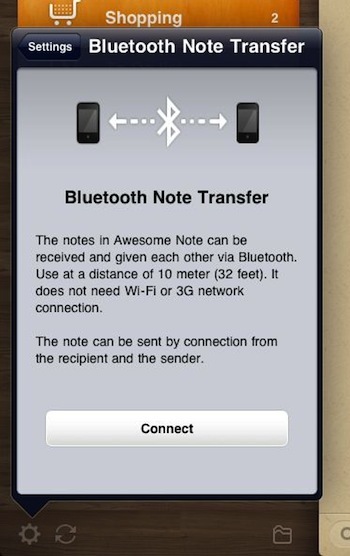 A feature of Awesome Note that is not covered often enough is it’s ability to pass notes from one iOS device to another view Bluetooth. Both devices does have to have the Awesome Notes app install to create/edit/view. 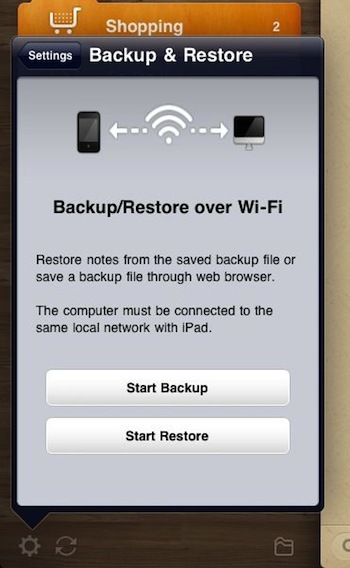 Backups outside of the normal iTunes sync is supported via Wifi to your desktop. Giving an extra layer of protection against major failures to keep your notes safe. 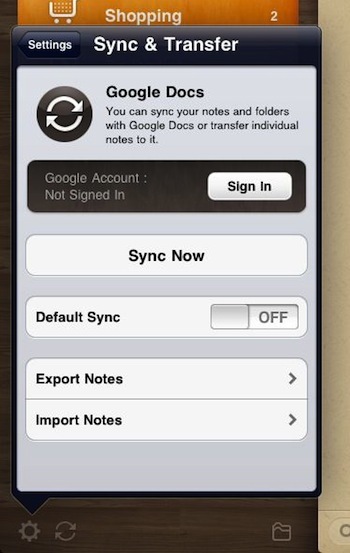 Both Google Docs and Evernote are supported for syncing. 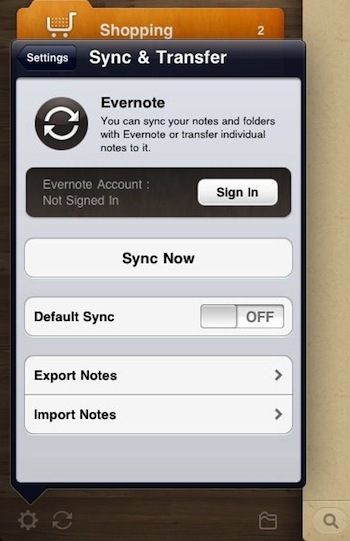 Import, export, and syncing of notes through either of these notes services. Grouping notes in Awesome Note is possible by choosing the list view icon on the lower right corner of the overall window. 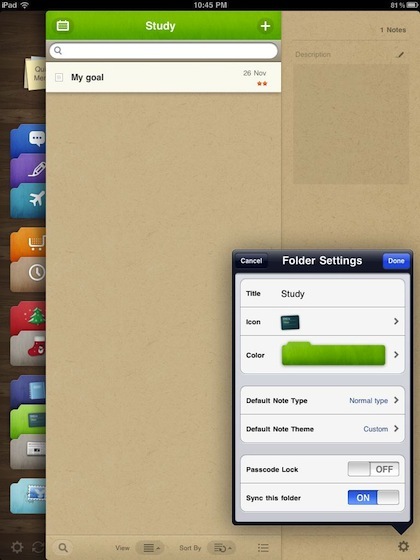 In this mode, multiple notes can be chosen to delete, marked done or moved to another folder. 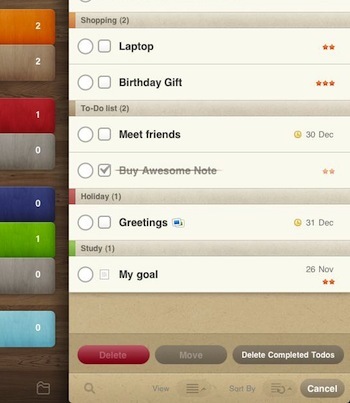 This feature is handy for grouping notes by project when projects are divided or scope changes. 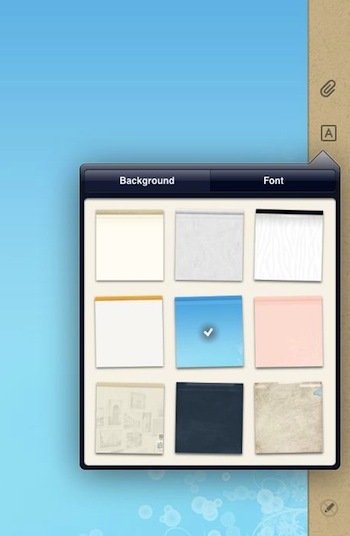 Paper backgrounds are chosen as well as fonts via the side bar of each note. These are not only nice when creating a note, it is handy when viewing notes in the Thumbnail view to know items that are similar. Via the same side bar, through the paperclip icon, is the picker to add an image or location map as well switching to handwriting electronic ink for that note. 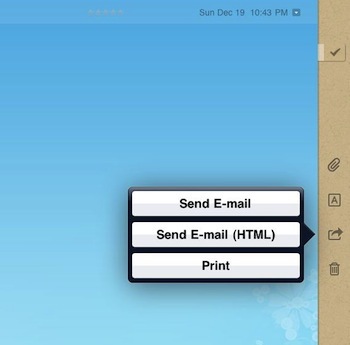 Each note can be emailed as a Awesome Note, as HTML or sent to a printer. When using more information than just typing in a note, the list is best viewed as ‘Detail’. This way images and other note attachments are shown with the short note text. Note below the Detail view also shows if the item is a ‘To Do’ item with an addition of a checkbox in the note. Folders can be created with unique names, colors, passcode locked and even if a particular note type should be the default for that folder. Since the folder list can go multiple pages, the feature of being able to quickly sort or edit the folder information is very handy. With Awesome Notes, your not locked down to a set of settings from the beginning so you don’t have to spend long hours planning out the system usage to start. Projects and the level of importance of notes change all the time, it’s nice having an app that can change as our needs change.